With a small melon baller, scoop out most of the seeds from the cucumbers. Make sure not to scoop all the way to the bottom so the dressing can be contained in the cup. Add about a ½ teaspoon of dressing to the bottom of each cup. 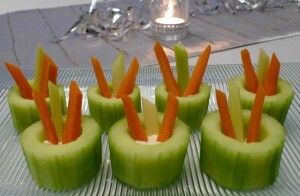 It won’t look like a lot, but when the carrots and celery are added, the dressing will rise up the sides a little. 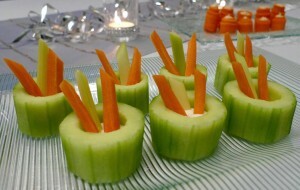 Add as many of the carrots and celery sticks as you like to each cup. PS. 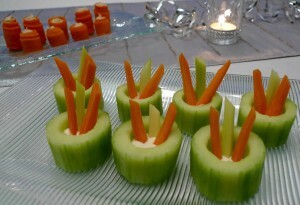 The appetizer in the background was another fun way to dress up carrots for the party. 🙂 I simply peeled a large carrot lengthwise so I ended up with long strips. Then I piped a small bit of store-bought hummus along each strip and rolled them up. The hummus acted as the glue. The finishing touch was a little more hummus piped inside the middle, and a thin round slice of carrot on the bottom as the base.